Singer Mbosso recently had to come clean following a recent post that he has bought a mega mansion worth millions. 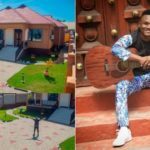 In his post, Mbosso failed to mention that his boss Diamond Platnumz actually paid for the house. Several statements later, his management made it clear that Diamond Platnumz gave him the house. Fans started trolling Mbosso’s ex-manager, Mkubwa Fella TMK later saying he was a fake manager. Mbosso used to be in an all-boy-group called Yamoto Band and fans wanted to know why he never bought him a house a house. Fake The manager, took to his social media defending himself saying that when Mbosso and the tree other members of the band were under his management, he bought them a house. “There are foolish people asking where is the house Yamoto band members. I repeat, they have homes in Mbande, Kisewe. I have been there for them when they started out, when they were mere kids. Mbosso’s brother lives in that house and his fellow ex-band-mate, Beka is paying the guard,” he said. Adding: “I’m not a fake manager ever since the days when I was managing Juma Nature. You can call him, he owns a home, even Mh Temba and Chege Chigunda. I was the one who invested heavily to ensure they have homes.” After that rant, Mbosso responded saying: “Mkubwa Sisi watoto wako tunajua maisha na msingi uliotupatia hadi kufika hapa .., …Midomo hii tumeumbiwa kuongea acha waongee tu… (“Sir, we as your protege’s we saw the life and foundation you have given us to this point in our career. These lips have been created to speak and talk, let them talk…)” he said. The post Mbosso’s ex-manager rants following Mbosso’s new mansion from Diamond appeared first on Ghafla! Kenya.